First of all, kudos to you for choosing to read a blog post about “Zainichi”, on a book titled “Pachinko”. Shoving weird Japanese words into your blog feed isn’t very polite of me, especially when I didn’t quite know what they meant before reading this book. You deserve a few explanations first. Zainichi means Foreigners staying in Japan, but it is used to define people with Korean ethnic roots who live in Japan and whose families came from Korea under Japanese rule (i.e. before 1945). It is therefore a derogatory word because these people aren’t really temporary immigrants and don’t want to be singled out from the main Japanese population. Pachinko is a popular arcade game, that is often operated by Korean people in Japan because they are not allowed into more honorable jobs, and that is associated by crime and yakuzas. I usually don’t read family sagas, because I prefer tighter plots and shorter timelines. When the characters are nicely drawn, I’m always sad to leave them to move on to the next generation. When the focus is on the family culture (may it be strong or dysfunctional) I’m always uncomfortable that characters are created as artificial variations of an archetype, and that the author’s intention would negate the individual freedom. But I’m glad I made an exception for this novel, which I chose as a read-along to our trip to Korea in August. Little did I know that only the few first chapters are taking place in Korea, but by then I was swept by the story and would have followed the characters anywhere. The book spans much of the 20th century (1910s to 1980s) and chronicles at the micro level the intertwined destiny of Korea and Japan, especially for people who are not particularly invested in politics or who are not educated enough to see how their particular fate is heavily influenced by historical, social and political facts far beyond themselves. 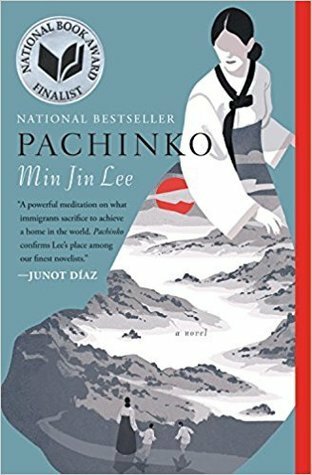 Pachinko is about the destiny of one girl, Sunja, the uneducated daughter of a poor inn keeper in the tiny Korean island of Jeju, whose life takes unexpected twists and turns when she bumps into a rather shady older man Koh Hansu. This meeting will have endless (and seemingly random) consequences all her life, as she marries a Christian priest and moves to Japan. Pachinko is meant to symbolise how luck and determination both play a role in life. Pachinko is also about sin and forgiveness and guilt, passed along generations with a heavy family secret. It is interesting to see Christian religion through the prism of Asian culture, but it is only one of the facets of the book. Immigrant identity, especially in the context of Japanese racial prejudices, is painted in detailed strokes. The book is both broad and intimate, and I enjoyed that the pace could slow down to a particular scene, or pick up to show how years passed in a few pages. Sunja’s life is full of tragedies and sadness, but it is not a sad book, and what comes out of it is the extraordinary resilience of this woman. Wonderful review! I’ve not yet read this but you’re review has me wanting to pick it up.